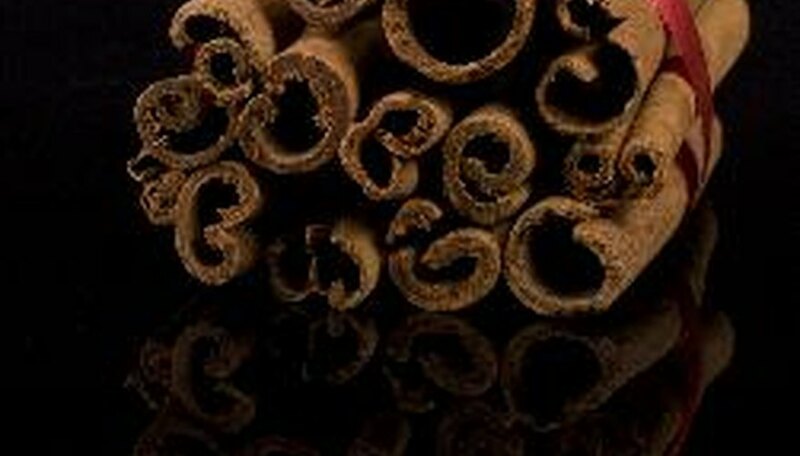 Cinnamon gets its powerful flavor and aroma from a variety of compounds that the tree uses specifically for the purpose of fending off attacks from insects and fungi. These versatile chemicals are fairly harmless to most mammals but spell certain death for many bugs, fungi and bacteria. Cinnamon trees come in four basic varieties: Cinnamonium verum ("true cinnamon" in latin) grows in Sri Lanka, and Burmanni (Indonesian), Loureiroi (Saigon) and Aromaticum (Chinese) cinnamon grow all over southeast Asia and the adjacent islands. Cinnamon oil can come from the bark of any of these trees, but the leaves of osmophloeum (Taiwan) cinnamon contain most of the same insect-repelling chemicals. This is the primary insect-controlling compound contained in cinnamon oil, and it comprises about 90 percent of the cinnamon oil by volume. Like some of the other compounds, this compound is extremely deadly to most insects, fungi and bacteria but fairly harmless for most mammals and fish. The powdered cinnamon that you purchase in stores is generally beechnut husk impregnated with cinnamaldehyde. This strong-smelling compound also burns the nostrils of most animals, which makes it a useful cat and dog repellent. If this chemical sounds vaguely familiar, it's because it's commonly sold as an over-the-counter local anesthetic for use on sore teeth. While not always extracted from cloves, this chemical is what gives cloves their signature flavor. Euganol is more toxic than cinnamaldehyde, but it only comprises a small percentage of the cinnamon oil by volume. By contrast, clove oil is about 90 percent euganol. Anethole (C10-H12-O2) is an ether compound in the same class and is only one carbon atom off of cinnamaldehyde. This chemical gives anise, star anise and fennel their signature flavor and is the primary flavoring ingredient in black licorice. This compound is a powerful antibacterial and antifungal agent. It's recognized as safe for humans within the prescribed dosages, but in high dosages it can cause a lowering of body temperature, reduced motor activity and hypnotic, anticonvulsant and analgesic (painkilling) effects. Cinnamon oil and its constituent chemicals kill many insects on contact and continue to act as a repellent for long afterward. It's especially effective against mosquitoes and bugs in their larval form, before they develop hard shells. Bugs won't eat from any food source impregnated with cinnamon oil, which is the primary reason that cinnamon trees evolved it in the first place. This includes human skin, which makes cinnamon oil a delicious-smelling alternative to commercial bug repellents. Because the ethers in cinnamon oil are hydrocarbons, they'll burn just like gasoline or kerosene; however, combusting these ether compounds turns them into carbon dioxide and water vapor, rendering them useless as an insect repellent. So if you're looking for an oil to keep mosquitoes away at night, stick with citronella.